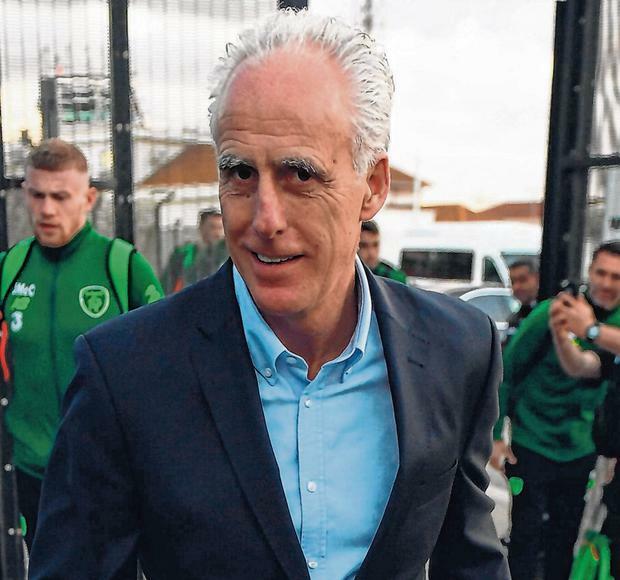 Mick McCarthy believes Gibraltar will try to use their artificial pitch to get into the heads of Ireland's players in tomorrow's Euro 2020 qualifier. But he will tell his group to block out any negative thoughts as they prepare for an unusual start to the Euro 2020 qualifying campaign. McCarthy has expressed concern about the impact of the Victoria Stadium surface on the game. And it emerged yesterday that there had actually been some local fears surrounding the quality of the surface for this match due to wear and tear. Ireland arrived in Gibraltar last night expecting that the pitch will add another variable to a match they will be expected to win comfortably. McCarthy thinks it gives the locals an advantage, an argument that was bolstered by Scotland's shock 3-0 loss on an artificial pitch in Kazakhstan yesterday. "If you play on it regularly, you get used to it," McCarthy said. "Nobody will ever tell me that it's the same as regular grass because it's not.They know it's a different surface and they will try to use it. It's almost like psychological warfare that one, with the plastic pitch. "But we've just got to go and play on it. That's what it is and we will get on with it. We have to make the best of it. I was out there on it and it's just a different bounce, the ball rolls differently. "It (the surroundings) only affects you if you allow it to affect you. It's about your mental approach going into the game." Ireland trained in Dublin before flying, with Sean Maguire sitting out the session as part of a pre-arranged plan to stay in line with his Preston routine.